WHAT BOOKS STOOD OUT IN THE PAST TWELVE MONTHS? ARTFORUM ASKED A HANDFUL OF HISTORIANS, CRITICS, AND ARTISTS TO NAME THE TITLE (AND, IN SOME CASES, TITLES) THEY MOST REMEMBERED FROM THE PREVIOUS YEAR. 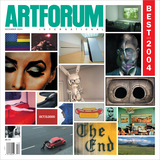 Order the PRINT EDITION of the December 2004 issue for $17 or the ONLINE EDITION for $5.99.